Definition: Osteomyelitis (OM), also called a bone infection, is an infection in a bone. It can happen if a bacterial or fungal infection enters the bone tissue from the bloodstream, due to injury or surgery. Symptoms may include pain in a specific bone with overlying redness, fever, and weakness. The long bones of the arms and legs are most commonly involved in children, while the feet, spine, and hips are most commonly involved in adults. Around 80 percent of cases develop because of an open wound. The word is from Greek words ὀστέον osteon, meaning bone, μυελό- myelo- meaning marrow, and -ῖτις -itis meaning inflammation. 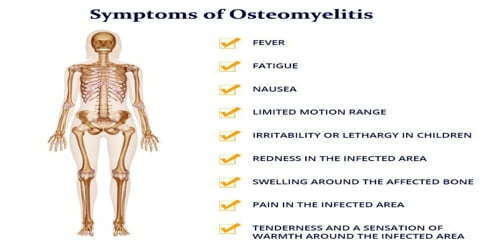 Most cases of osteomyelitis are caused by staphylococcus bacteria, types of germs commonly found on the skin or in the nose of even healthy individuals. Risks for developing osteomyelitis include diabetes, intravenous drug use, prior removal of the spleen, and trauma to the area. Diagnosis is typically suspected based on symptoms. This is then supported by blood tests, medical imaging, or bone biopsy. Treatment often involves both antimicrobials and surgery. In those with poor blood flow, amputation may be required. Treatment outcomes are generally good when the condition has only been present a short time. Osteomyelitis (bone infections) can happen suddenly or develop over a long period of time. If they’re not properly treated, bone infections can leave a bone permanently damaged. The symptoms of chronic osteomyelitis are always not obvious, or they could resemble the symptoms of an injury. This can make an accurate diagnosis more difficult, especially in the hip, pelvis, or spine. 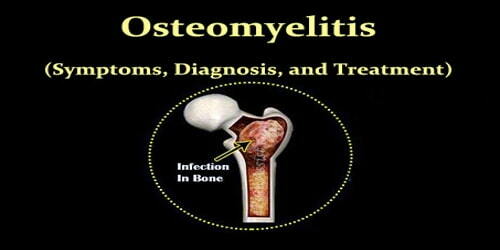 Diagnosis and Treatment of Osteomyelitis: The diagnosis of osteomyelitis is complex and relies on a combination of clinical suspicion and indirect laboratory markers such as a high white blood cell count and fever, although confirmation of clinical and laboratory suspicion with imaging is usually necessary. The physician will examine the affected body part for signs of osteomyelitis, including tenderness and swelling. They will ask about recent medical history, especially any recent accidents, operations, or infections. Biopsy: The physician takes a small piece of tissue to test which type of pathogen – bacteria or fungi – is causing bone infection. This helps to find a suitable treatment. The most common treatments for osteomyelitis are surgery to remove portions of bone that are infected or dead, followed by antibiotics. Hospitalization is usually necessary. Open surgery is needed for chronic osteomyelitis, whereby the involucrum is opened and the sequestrum is removed or sometimes saucerization can be done. Hyperbaric oxygen therapy has been shown to be a useful adjunct to the treatment of refractory osteomyelitis.